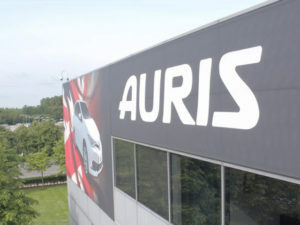 Toyota has confirmed that its third-generation Auris will be built at its UK plant in Burnaston, Derbyshire, which manufactures the current model, while most of the engines will be supplied by its facility in Deeside, Wales. The announcement follows days of speculation and comes ahead of the new model’s unveiling at the Geneva Motor Show next week. Last year saw Toyota Motor Europe (TME) announce investment of more than £240m investment in Toyota Manufacturing UK, with the Burnaston plant to get new equipment, technologies and systems to enable manufacture of vehicles on the Toyota New Global Architecture (TNGA) platform.